During summer scouting in August with trail cameras, a beautiful mature 10 pt was showing on a regular basis during daylight hours. I viewed his pictures and shared them with friends and hunters near my hunting property in Southeast Iowa. The buck appeared wide with decent mass but had a very distinct antler feature. Both of his g2’s were shorter than his g3’s. His g4’s were almost as long as his g2’s. The side profile of the buck reminded me of the Olympic medal podium, gold high in the center with silver and bronze lower on each side. I went back and forth as to how old and total inches of his antlers. I came to the conclusion that he was at least 4.5 and would gross score around 160 inches. I told myself that I didn’t want to shoot this buck for various reasons but believed he would be a nice buck for someone. The pictures continued to come in September and October at various scrape locations. Most of them came from one particular scrape with the buck usually traveling the same direction in the morning and evening hours. I was beginning to believe that he was a home body buck with a small range. I felt he was traveling to and from three different hinge cut bedding areas to feed in brassica/cereal grain/clover food plots. I never determined a consistent pattern but felt I had a good idea as to where he was bedding and feeding. 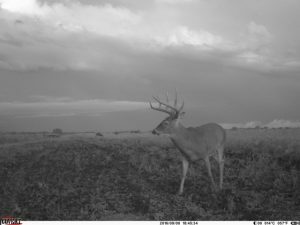 Its one thing to know where a buck is living but the hard part is predicting what influences them to move during daylight hours. When they do move in daylight, it’s a roll of the dice for a hunter to be in the right place at the right time. We all know that a buck’s behavior and senses will weaken in November. I continued to scout with cameras through October and didn’t hunt or intrude on his area. I allowed him to move about freely on two different parcels of property hoping he would become even more comfortable with moving in daylight. Friends Barrett and John from Mississippi were arriving on November 5th. My hope was that the timing of the rut would have the “podium buck” on his feet in his core area as they began hunting. Sure enough, the buck ran past John at 25 yards chasing a doe early in his hunt. It was love at first sight, John was convinced this was the buck he wanted to hunt and tag. Over a period of seven days, John and Barrett viewed the buck nearly every day with three close encounters. Between the three of us, we tried every thing we could think of to get John within bow range for a shot. The buck’s small core home area became even more apparent. We knew where he was and seeing him daily but unable to get in the right place at the right time. John went home with a tag but left a hunting memory with me, naming the buck “Houdini”. 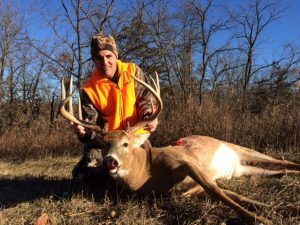 As November ended and December began, so did the Iowa shotgun seasons. Ike and Matt traveled to Iowa from Michigan to try their luck on Houdini. He was visible on trail cameras in darkness during this time but never showed himself during their five-day hunt. The deer were given a break with the properties providing sanctuary during the second shotgun season. The weather turned cold with snow and many hunters stayed home. An early morning trail camera picture of Houdini on Monday, opening day of late archery and muzzleloader was a welcoming site. The picture determined the buck made it through fourteen days of shotgun madness. Randy was arriving on December 26th. The goal and target for his late season black powder hunt was Houdini. 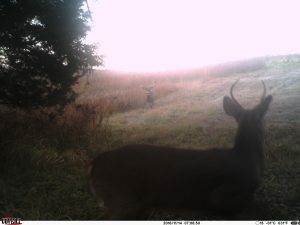 During the first morning of his hunt, I viewed the buck in the wild for the first time while checking a trail camera. He was in the exact location where John and Barrett viewed him on consecutive days in November. He bedded down in wide open CRP grassland while I viewed him through binoculars. This is the very reason the buck was hard to hunt, he was using the habitat and terrain to his advantage. It was difficult to get close to him without risking bumping him. Randy viewed the buck on his second afternoon of hunting in a food plot that I call the airstrip. It’s a long narrow strip of brassicas in CRP. 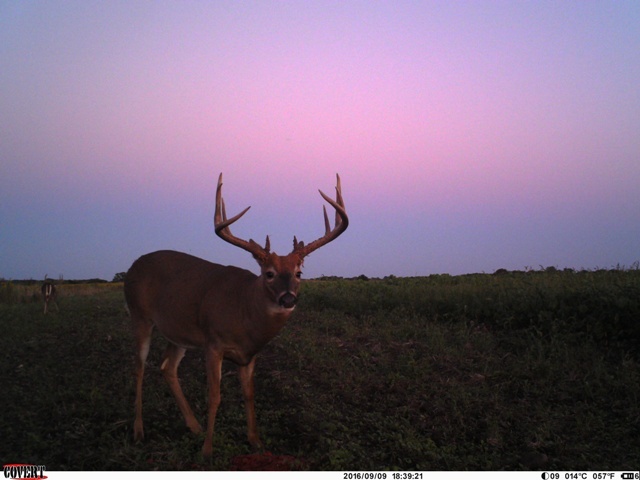 The first velvet photo of Houdini came from that food plot in August. That night I advised Randy to hunt from a wooden structure blind called the “huntin shack” on the south end of the property. This blind was built and constructed by Randy in 2010. My thought was the buck went north from his bedding area the prior afternoon; he would return to the south property the next morning. The next day was the 29th, a new moon, which provided a minor activity period beginning at 7AM. Randy was in the blind early and Houdini followed the script but his magical escape ability came to an end. 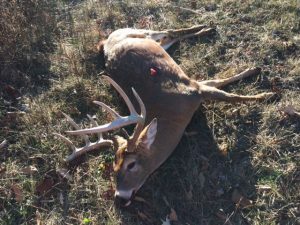 Randy was in the right place at the right time, he placed the bullet into the buck’s lungs from eighty yards. We approached the search together with me finding blood near the spot of bullet impact. After following the blood trail a short distance, I viewed something on the mowed path ahead. Upon closer view with binocs, I declared the Houdini magic show to be over. I high fived Randy as we walked to the magnificent animal. He was the legend of this fall, magically escaping us, our hunting tactics and cheating death for two months. Great story John. It’s was fun trying to bag him with my brother, John Thomas. I thought for sure we were going to get him. Glad he stayed on the property and one of your hunters got him.